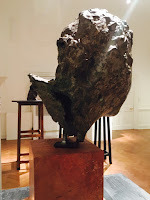 Declaration of interest: I first saw the poetically waxen sculptures of Medardo Rosso during a European art tour (a budget European art tour, dear reader). I have loved his work ever since. The Rosso work I saw in the Salon of the Museum of Contemporary Art Belgrade and elsewhere was different to any sculpture I had ever seen before. It had about it the texture and luminosity of the living subject. The other striking thing that visiting the Ropac London exhibition has allowed me to try to articulate (and I'm not the first) is this. At a time when sculptors engaged mainly in 'monumental' work (think Rodin) and work that commemorated the great of crown, church or state (think Rodin again), and, furthermore, often set out to replicate the style of Greek or Roman predecessors, Rosso's subjects were mostly street urchins. His style (I believe) speaks to the wax effigies of medieval times that were constructed (on wooden frames) as a memorial to the dead. Many of the subjects were children. Later this year, when The Queen's Diamond Jubilee Galleries open at Westminster Abbey, we will be able to learn more about the techniques of these medieval sculptors in wax. At Ropac, we have a gathering of 12 lifetime casts, generously lent by private collectors, art institutions and the Museo Medardo Rosso in Milan. Before they return to their owners, I would like to suggest that we study them more closely. For, as many have suggested, they are pivotal in helping to bring the monumental and classical down to earth and out of the halls of academia. If they were to be reproduced, using the artist's extant moulds, they could be teaching instruments. The monumental was a lengthy phase in the literary arts too. It was the 18th century English poet Thomas Gray who brought them out of it. Gray, in Elegy Written in a Country Churchyard, was the very first to write, in the formal elegiac form, about ordinary people, those known only to their families and communities. * Rosso's 'Laughing Woman', 'Concierge', 'Jewish Boy', 'Child in the Sun', 'Man reading', 'Ill person in hospital', 'Sick child', are of the same stuff. The sculptor's techniques were equally innovative. He worked in plaster, wax and bronze. Plaster sets hard, but before it sets it is wet and it is viscous (read the very devil to work with). Rosso used it structurally, not only in modelling and casting but as the base of many of his wax sculptures. Then there is his mastery of the even harder to handle beeswax (see image below). But I must stop this section here. But I would love to revisit this exhibition - this time accompanied by a materials scientist, to try to find out how exactly he managed this magic. It is Rosso's portraits of infants - or indeed of the poverty stricken or sick - that form the most elegiac part of his work. Perhaps he intended to evoke the earlier days mentioned above when many children died either in infancy or in childhood. In commemorating them, Rosso has ensured that it is humanity rather than status that shines through. They are masterworks. The exhibition carries a scholarly underpinning that consists of Rosso's drawings, sketches, photographs and correspondence and which does much to provide a context for the work shown. The exhibition is co-curated by Sharon Hecker** and Julia Peyton-Jones. 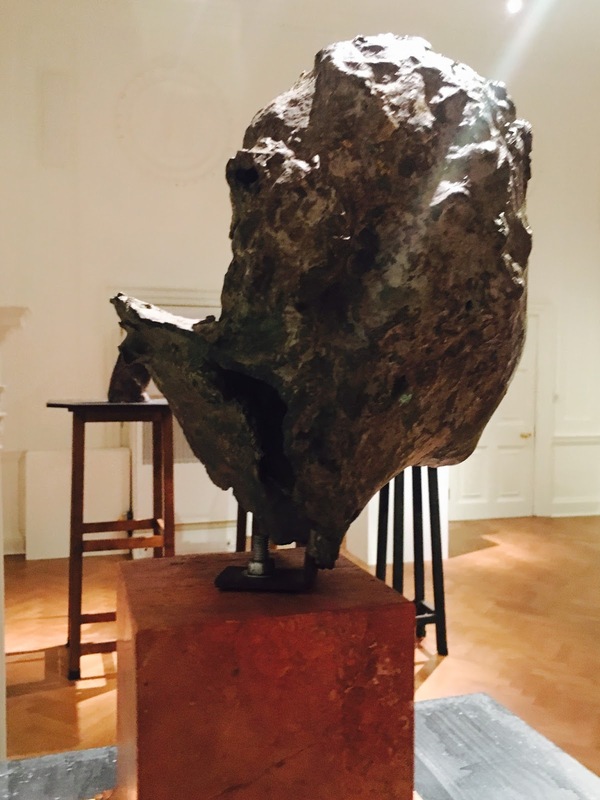 A book, Medardo Rosso: sight unseen and his encounters with London, cataloguing the exhibition and charting its origins, and written by Sharon Hecker and Julia Peyton-Jones and with a Foreword by Thaddaeus Ropac, is available from the Gallery. * See Dolan, John, 2000, Poetic Occasion from Milton to Wordsworth, Palgrave Macmillan. ** See also Hecker, Sharon, June 2017, "The afterlife of sculptures: posthumous casts and the case of Medardo Rosso (1858-1928)", in The Journal of Art Historiography, No. 16.